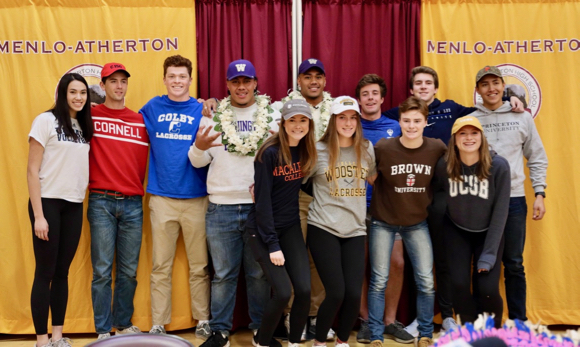 Today Menlo-Atherton High School celebrated its scholar athletes who have signed letters of intent to play their sport at the college or university of their choice. The program began with four-star recruit Daniel Heimuli (pictured below), who had yet to declare publicly where he was headed. Three caps were arranged in front of him, representing the University of Oregon, Alabama, and the University of Washington, which was the cap that went on his head. 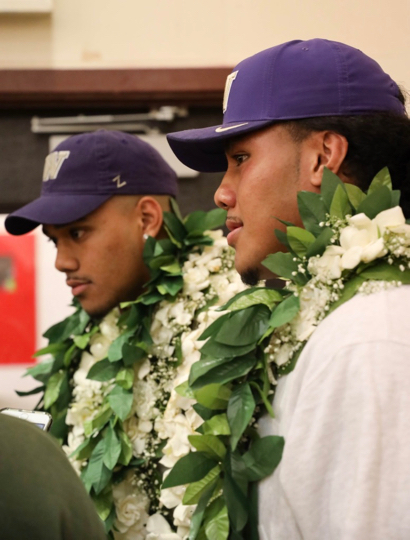 He joins fellow football player Noa Ngalu at that Pac 12 school. “Evelyn Calhoon is a four-year varsity wrestler at M-A, winning two team CCS titles along the way with hopefully a third to add after next weekend. In addition to her success on the mat, Evelyn is also an amazing soccer player and will be signing to play soccer at Brown University in Providence, Rhode Island. “Jessica Eagle is a three-year varsity track athlete at M-A and owns the honor of being the fastest female athlete in our entire section (over 150 schools) last year. She is also in the top five of school history in the 100m, 200m, and 4×100 relay. She is still undecided on where she will take her talents next year. “Maggie Hall (pictured below) is a two-sport athlete at M-A, playing both soccer and track all 4 years. As a sprinter, she was the CCS champion in the 200m, and she is top five in school history in the 100, 200, 400, 4×100, and 4×400. 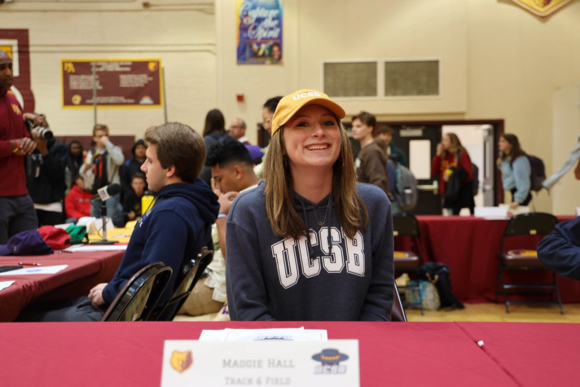 Maggie will be running track at the University of California, Santa Barbara. “Jack Hansen (pictured below with Colby shirt) is a two-sport athlete at M-A, excelling in both football where is was a two- year varsity player and a recent state champion, and also in lacrosse. Jack has chosen to play the latter at Colby College in Waterville, Maine. “Daniel Heimuli is two-sport athlete at M-A, playing both baseball and football. This year, Daniel was a captain of the team and helped lead them to the first state title for an M-A team sport in 30 years. He was also just named the Defensive Player of the Year in the Polynesian Bowl in Hawaii. 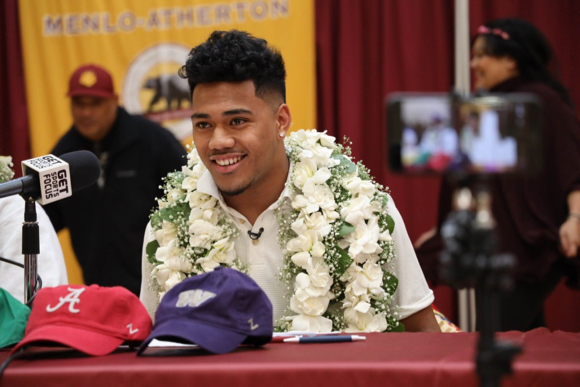 Daniel has chosen to continue his education and football career as a Huskie at the University of Washington. “Julia Kispert is a two-year varsity soccer player, winning a league title last year and her team is currently tied for first again this year with two games left. She is an aggressive attacker and will be a huge asset to the Scots of Macalaster College in St. Paul, Minnesota next year. “Alicia Letvin (pictured below) is a three-year varsity volleyball player, part of a proud legacy of amazing volleyball players to come out of M-A in recent years. She has won two league titles, and a NorCal title in her time as a Bear. 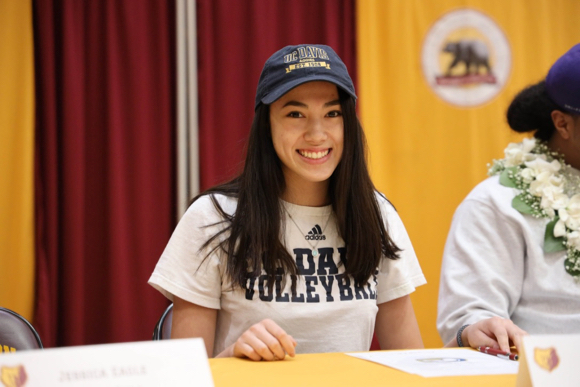 She will trade in her maroon and gold for blue and gold next year and play at the University of California Davis. “Axel Ljunggren four-year varsity rower and second year captain on NorCal Crew. He claimed a gold medal in the Varsity 4 and bronze in the Varsity 8 at the 2017 southwest regional championship and placed 11th at the US national championship in the Varsity 8. 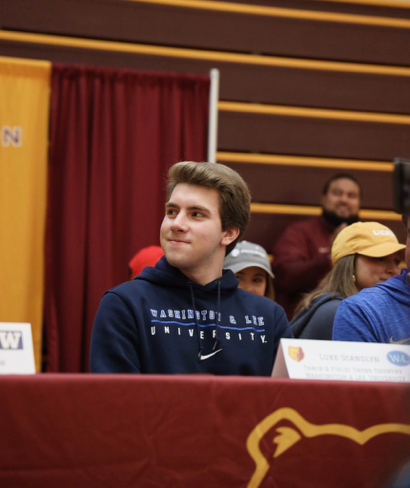 Axel will attend the Cornell University College of Engineering in Ithaca, New York and continue his rowing career on the Cornell lightweight rowing team. “John Mills has played both basketball and lacrosse at M-A and is also a proud captain of our 12th Man club on campus. He is a four-year varsity lacrosse player, two years as a captain and 1st team all-league the last three years. He will continue his education and playing career at Washington and Lee University in Lexington City, Virginia. “Noa Ngalu is a three year starter on our state champion varsity football team. In his time at M-A, he has won two league titles, two CCS titles, two NorCal titles, and one State Title. He was also a starting defensive lineman at the prestigious Polynesian Bowl in Hawaii about two weeks ago. Noa will be joining his teammate Daniel to play at the University of Washington in Seattle next year. “Will Olson is three-year varsity rower at NorCal Crew in Redwood City. He holds the team record for the 6000 meter erg and a top 10 all-time 2000 meter erg. Last summer he rowed with a Boston-based team called C.R.I., and led the Varsity 8 boat to a silver medal at the Club National Championships on the East Coast. He will be continuing his career on the lightweight rowing team at Princeton University in Princeton, New Jersey. “Luke Scandlyn (pictured above right) is part of a proud and incredibly talented clan of Scandlyns that have run at M-A. He is a two-sport athlete at Menlo-Atherton, having run both cross country and track all four years, and earning all-league honors in both sports. Luke’s times are in the top 10 of school history in 1200, 1600, 3200, Distance Medley Relay for track. Luke will continue his education and running career at Washington and Lee University.